In Mah Jong(g) before Mah Jong(g) Part I, Section 3.2, (Stanwick, 2004), I briefly described a bamboo precursor tile set collected by the Sinologist Carl Himly, sometime during his stay in Shanghai as an interpreter in the German Consular Service, between 1868 and 1876. This precursor tile set was described by him in a very long article published in 1889 and in another shorter article in 1901. According to Himly (1889) the “Ningpoer Bambuskarten” (Bamboo Cards of Ningpo), in Chinese 寧波竹牌 Ningbo Zhu Pai 1, were part of his own collection of Chinese playing-card packs. In this article I have produced his original 1901 descriptions2 of the Ningbo Zhu Pai and used them for a reconstruction of the tile set. In the Conclusion of Part 2 of “Mahjong(g) Before Mahjong(g)” (Stanwick 2004), I suggested that the Ningbo 1889 Wilkinson Pattern had survived until 1901 without modification, as exemplified by the Shanghai Laufer Pattern. In this rather detailed article, I introduce two new tile sets and propose they represent this Pattern. Based on these, I further propose that this Pattern – in Shanghai at least – may have continued to exist, with certain modifications, from 1901 to at least 1923. Translated by Thierry Depaulis, from the German, with some additional comments in square parentheses. 1. The Himly Set Pattern Reconstruction. Following a discussion of some of his money-suited card packs, Himly notes that although his discussion was about ‘paper cards’, that is paper 牌 pai, the Chinese word pai may refer to any “piece”, such as bamboo domino pieces. Further, because the Bamboo Cards of Ningbo also have the ‘so’ (suo, strings) and ‘wan’ of the ‘shi hu pai’ (i.e. money-suited cards), they should therefore not be removed from the general category of “cards”. Where the description is vague or ambiguous I used the AMNH Glover set as a reference, since both the Himly set and the Glover set are contemporaries and contain very similar tile groups. Thus, since Himly did not describe the form of the ‘strings’ in the ‘String of Cash’ suit, I decided to make each of the the ‘strings’ identical to the corresponding ‘strings’ in the Glover set. I also had trouble understanding Himly’s description for the # 2 and # 3 of ‘Cash’, and so their depictions are my best interpretation. Apart from the # 5 of ‘Cash’, a ‘hole’ is also mentioned in the description of the # 2 ‘Cash’ coins. However, when depicting the rest of the ‘Cash’ coins – even though Himly does not mention a ‘hole’ – the ‘hole’ was taken for granted and represented in a similar fashion to the AMNH Glover set – as largish dots the same colour as their respective coins – unless Himly stated otherwise. Figure 1. The Himly tile set reconstruction. In Figure 1, the colours of the frames have been lightened, relative to the rest of the colours, so as to make them distinguishable. The discrepancies with the AMNH and BMA Glover sets are (1) the tiles are made of bamboo rather than a combination of bamboo and bone (2) the presence of the three 化 ‘hua’ tiles, the presence of a 摠王 ‘zong wang’ tile and the absence of four 中 ‘zhong’ tiles. Further, (3) there are colour differences on the # 6 and # 7 of ‘Cash’ and more conspicuously on the # 6 and # 7 of ‘Strings of Cash’. The author’s comments are also in square parentheses. Italics added. 2.0 A Possible Standard Pattern in Central China. 2.1 The Wilkinson/Laufer Pattern Post-1920. The first task is to establish what characteristic(s) demonstrate(s) a pattern to be a Wilkinson/Laufer Pattern. After comparisons of numerous tile sets (and the card set # xviii in Prunner, 1969) with the Wilkinson and Laufer tile sets (see Stanwick 2004, Part 2), the only characteristic is stipulated to be: (1) the # 1 ‘String of Cash’ in conjunction with the rest of the pointed ‘Strings of Cash’ suit. Thus, if (1) is present, the tile or card set can be recognised as a direct form of the Wilkinson/Laufer Pattern. In other words, the absence of (1) prevents the pattern being recognised as a direct form of the Wilkinson/Laufer pattern and the presence of (1) allows the pattern to be recognised as a direct form of the Wilkinson/Laufer Pattern. Thus (1) is both a necessary and a sufficient condition for the Wilkinson/Laufer Pattern. Recently, a 麻雀 ma que4 tile set (Figure 2) was acquired by the author from the United States, bearing the necessary/sufficient condition above, and having other tile group patterns5 very similar to those in the precursor Wilkinson/Laufer tile set Pattern (see Stanwick 2004, Part 2). No location of manufacture is known although the focal point for Mahjong set manufacture and export was Shanghai (The Chinese Economic Monthly, 1924). The tile set consists of 144 pieces. Each piece is composed of bone joined with a transverse dovetail joint to a bamboo base. Their dimensions are: Length 27mm. Width 20mm. Height 8mm. The set is housed, with accessories, in its original two-drawer wooden box. As well as the five drawer variety, this type was also used for Mahjong(g) sets exported from China to the West after 1920. The similarities between the Figure 2 Pattern and the Wilkinson/Laufer Pattern are: (1) the identical representation of the 1 of ‘Cash’ as well as (2) the 1 of ‘Strings of Cash’ and the rest of the pointed ‘Strings of Cash’6 – the necessary/sufficient condition criteria (as mentioned above); (3) The presence of a ‘simple’ form for the 万 wàn ten thousand (myriad) character in the ‘Myriads of Cash’ suit (this is also a feature of both circa 1875 Glover sets and the Himly set; (4) The presence of the ‘Four Directions’ group as well as the three so-called (in the West) ‘Dragons’. The differences between the Figure 2 Pattern and the Wilkinson/Laufer Pattern are: (1) The presence of Arabic numerals (1, 2, 3, etc) and English letters. (2) Within the character 發 fā, the central right sub-character is 殳 shū meaning ‘spear’, rather than – as in the character fā of the Wilkinson, Laufer and Culin sets – the sub-character 失 shĭ meaning ‘arrow’ 7. (3) Four double framed ‘Seasons’ tiles bearing the large red Chinese characters 春 chūn, Spring, 夏 xià, Summer, 秋 qiū, Autumn, 冬 dōng, Winter8. (5) Each of the coins on the 2 to 9 of ‘Cash’ tiles are represented by multiple circles – that is, one inside another. The number of circles used for each coin on each tile is in the distribution [23c, 33c, 42c – 92c]9. But the Wilkinson/Laufer Pattern distribution is [22c, 32c, 41c – 91c]10. It should also be noted that the use of the colours blue, green and red in the ‘Cash’ suit, and in certain instances in the ‘String of Cash’ suit, did vary over time. However, by 1920 this practice had all but finished and where these two suits were concerned the use of these colours appears to have become conventionalized11. The Arabic numerals and English letters may have been put on at a date later than the origin of the tiles (an intermittent practice according to Foster (1924)), or the numbers and letters were present on tiles much earlier than July 1919 – the date Babcock claimed to have put them on the pieces (Foster 1924)12. However, when taken with tile size, defined by length and width13, and the nature of the box, it is the author’s view that a post-1920 date is suggested for the Figure 2 set14, although it seems that the representations for the # 1 ‘Cash’ and # 1 ‘String of Cash’ of the Wilkinson/Laufer Pattern were not to become part of the dominant pattern form after 192015, when the game exploded onto the Western market. The Figure 3 tile set consists of 148 tiles. Each tile, composed of bone joined with a transverse dovetail joint to a bamboo base, has the dimensions: Length 33mm. Width 21mm. Height 7mm. All are housed in the original wooden box with five trays and a sliding front cover. This set was imported into the United States by the Mah Jongg Sales Company of America sometime after 192316. The pattern in this set has the necessary/sufficient condition that allows it to be recognized as belonging to the Wilkinson/Laufer species. The # 1 ‘Cash’ is now a crudely executed flower, although it retains a red central circle, and the distribution of the ‘Cash’ suit coins is [23c, 32c, 42c – 92c] compared to the Wilkinson/Laufer distribution [22c, 32c, 41c – 91c]. Further, the style of engraving of the ‘South’, ‘West’ and ‘North’ characters is very similar to the style found in the Laufer tile set but, as in Figure 2, the character 發 fā now contains the later sub-character 殳 shū, rather than the earlier sub-character 失 shĭ 17. Of special significance are the four ‘Season’ tiles, each depicted by a large red Chinese character bordered by a partial frame comprising four small circles. These provide a link with Figure 2118. Based on these observations, and the further observation that Figures 2 and 3 belong to the species of tile set that embodies the Wilkinson/Laufer Pattern (based on the necessary/sufficient condition criteria), and assuming the sets presented here are a representative sample19 of this species, it is tentatively proposed20; (1) Between circa 1889 and 1901, the number of circles for depicting each coin on each of the ‘Cash’ suit tiles, plus the form of the wan character and the form of the pointed ‘Strings of Cash’, became standardised within Jiangsu Province at least, in the East Section of Central China. (2) Between 1920 and 1923 the basic Wilkinson/Laufer Pattern may have continued as a relict21, after undergoing modification of; (a) the fā character22; (b) the colours used in the 4 and 5 of ‘Cash’23; (c) the number of circles used for the ‘Cash’ suit coins – from the 1889/1901 distribution [22c, 32c, 41c – 91c] to the post-1920 distribution of [23c, 32c, 42c – 92c] and [23c, 33c, 42c – 92c]24; (d) the modification of the # 1 ‘Cash’. (3) Between 1901 and circa 1923 an atavistic form for the ‘Season’s’ group was included25 and (4) the wan character and the pointed ‘Strings of Cash’ remained unchanged. Pinyin Romanisation of Chinese is used throughout this article. The Pattern of this set is nearly identical to another set in the author’s collection, collected in Shanghai, but lacks Arabic numerals and has an early form of ‘Cash’ suit coin distribution of [22c, 32c, 41c – 91c](see footnote 9 below). It appears that pointed ‘Strings of Cash’ were sometimes used in other tile set patterns after 1920. Further, single-circled ‘Cash’ coins were also used in other post 1920 tile set patterns, but relatively rarely, to form ‘hybrid’ patterns. It seems that the character 失 shĭ continued to be used sporadically well into the early 20th century. But what would become the more prolific character 殳 shū was also in use as early as 1909, as seen in the Nagawa tile set of 1909 (in the illustrated Japanese ‘A Guide to Mahjong Museum’ (2002) and in Ebashi, 2005). Importantly, the depiction of the ‘Seasons’ is very similar to those in the Himly (Himly, 1901) (see Figure 1) and Glover sets of the 1870’s (see Stanwick 2004, Part 1) and hence may represent an atavistic form (see footnote 25) for this group. However, the absence of a ‘Flowers’ group may suggest that this tile set pattern represents a relict (see footnote 21). For example, each coin on the 2  of ‘Cash’ is composed of 3 circles [3c], thus [23c]. This is also the case for the ‘Cash’ suit in both circa 1875 Glover sets. For example, in Figure 2, the 4 and 5 (excluding the middle coin) of ‘Cash’ have their four coins made of circles that are blue and green. However in the Himly, Glover, Wilkinson and Laufer Patterns, they are solid blue (except for a red dot in the middle circle of the 5 of ‘Cash’ tile). Importantly, the ubiquitous red centre coin appears in the 1901 Laufer 5 of ‘Cash’ and remains the dominant form thereafter. (Note; the # 2 of ‘Cash’ contains blue and green circles in the Wilkinson Pattern but just blue circles in the Laufer Pattern. Foster (1924) describes a claim of “English numerals” being put on a particular set as early as 1914. Foster (1924) illustrates three sizes of tile. The smallest is of length 27.5mm x width 20mm. There is the problem of dating sets when there is no accompanying documentation. There is also the problem of sample bias and the assumptions it necessarily generates. Both can lead to assigning undue weight to speculations from the scant evidence we have. These problems are acknowledged when drawing hypotheses that seek to explain the materials presented in this article. A point mentioned by Ryo Asami at www.asamiryo.jp/COLECTION.htm (in Japanese). This dominant form was in production as early as 1909, as evidenced by the tile set collected by Stewart Culin in Shanghai (see Stanwick 2004, Part 2) and partly by the’hybrid’ tile set ( lacking the ‘Flowers’ and ‘Seasons’ – which may have been lost, and having pointed rods for ‘Strings of Cash’) collected by Hikosaku Nagawa shortly before 1909 ((‘Illustrated Book of the Mah-Jongg Museum’ 1999),( the illustrated Japanese ‘A Guide to Mahjong Museum’ (2002) and (Ebashi, Issue 10, 2005)). According the the Mah-Jongg Sales Company of America catalogue (1922), their sets were sold with ‘Babcock’s Red Book of Rules’ booklet. The booklet with this set has a last printing of October 1923. It is recognized these propositions may have to be modified or abandoned should new evidence come to light. An object- in this case each ‘Seasons’ group ideograph – that survives in a primitive form. 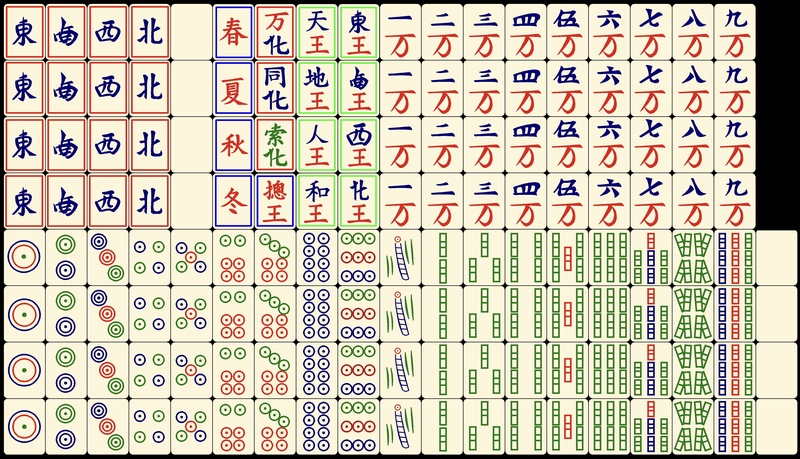 Apart from observations from Figures 2 and 3, propositions (2), 2(a), 2(c) and (3) and (4) are also supported by observations from of a tile set, of the same species as Figure 7 and 8, appearing on the photograph page of “Method of Mahjong” by Tokusaburo Nakamura, published in 1924 (see Ebashi, Issue 9, 2005). A form that has a resemblance to its remote ancestors rather than to its parents – as in the portrayal of the ‘Seasons’ group characters, which reflect the style in the Glover and Himly sets rather than the predominant style found in the contemporary sets of the early 1920’s. It appears the basic precursor Wilkinson/Laufer Pattern survived as a relict to at least 1923, with modification of the ‘Cash’ suit colours and symbols, with modification of the fā character, and with the addition of four ‘Season’ tiles depicted in their atavistic form. As well as the aforementioned, there was the addition of extra tiles, some of which resemble groups from the earliest precursor sets. Various features of this basic Pattern were used in other tile set patterns to form hybrid Patterns – as in the 1909 Nagawa tile set for example. It also survived alongside the 1909 Culin Pattern that was set to become the dominant form after 1920. But the Culin Pattern appears to represent another pattern tradition that also underwent modification prior to 1920, as I hope to illustrate in Part 2. Special thanks to Thierry Depaulis for his help procuring and translating the Himly texts and to Tom Sloper and Michael Hutchinson for their help creating the Himly graphic. Thanks to Troy Ozama for his Japanese translations. Ebashi, Takashi, ‘Proto Mahjong. Mahjong tiles in the 19th Century’. In: Mahjong Museum Report, Vol. 5, No. 2, Issue 9, April 1, 2005, pp. 14 – 17 (in Japanese). Ebashi, Takashi, ‘Proto Mahjong. Mahjong tiles in the 19th Century’. In: Mahjong Museum Report, Vol. 5, No. 3, Issue 10, July 1, 2005. pp. 14 – 17 (in Japanese). Ebashi, Takashi, ‘Proto Mahjong. Mahjong tiles in the 19th Century’. In: Mahjong Museum Report, Vol. 5, No. 4, Issue 11, October 1, 2005, pp. 14 – 17 (in Japanese). Foster, Robert, Frederick, Foster on Mah Jong, New York, 1924. Himly, Carl, ‘Die Abteilung der Spiele im ‘Spiegel der Mandschu-Sprache’, VII’. In: T’oung Pao, 2nd series, Vol.II, 1901, p. 20-3. Himly, Carl, ‘Morgenländisch oder abendländisch? Forschungen nach gewissen Spielausdrucken’. In: Zeitschrift der Deutschen Morgenländischen Gesellschaft, XLIII, 1889, p. 415-463 + 555-578. Prunner, Gernot, ‘Ostasiatische Spielkarten’. Bielefeld. 1969. Stanwick, Michael, ‘Mahjong(g) Before Mahjong(g): Part 1’. 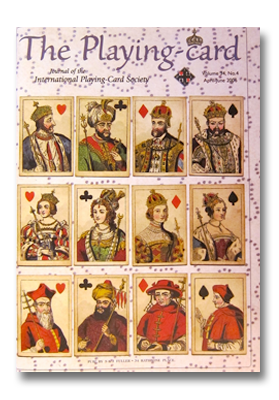 In: The Playing-card, Vol. 32, No. 4, 2004, pp. 153 – 162. Stanwick, Michael, ‘Mahjong(g) Before Mahjong(g): Part 2’. In: The Playing-card, Vol. 32, No. 5, 2004, pp. 206 – 215. ‘The Rise of Mahjongg’. In: The Chinese Economic Monthly. Compiled and Published by the Chinese Government Bureau of Economic Information. No. 4, January, 1924. pp. 1 – 10. Glittering History and Culture of Mahjong. A Guide to Mahjong Museum. Edited by the Mah-Jongg Museum (no author name). Publisher: Takeshobo, 2002. (In Japanese). “Illustrated Book of the Mah-Jongg Museum,” or literally translated “Mah-Jongg Museum Big Encyclopedia”. Edited by the Mah-Jongg Museum (no author name). Publisher: Takeshobo, April 1999. “Mah-Jongg, The Game of a Thousand Wonders,” Mah-Jongg Sales Company of America. San Francisco. 1922. (In Japanese and English).